If you love flamenco or are interested in finding out more about it, take a look at the information below. 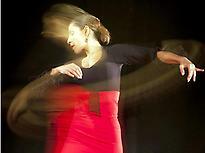 You'll find important flamenco centres, shows, competitions and all kinds of flamenco dancing and singing events. From the Flamenco Biennial in Seville (Andalusia) to the Cante de las Minas Festival (Murcia), including all the information offered by the Regional Government of Andalusia's Flamenco Centre (Cadiz). Here are some tips so you know where to go and which festivals to visit if you really want to discover traditions like "cante jondo" singing, fusion flamenco, or flamenco mass and operas. Enjoy its artistic side at a flamenco club, or explore the Andalusian roots by travelling to the south of Spain. You'll learn all about flamenco and you'll remember your trip forever! The Suma Flamenca Festival. Madrid. Andalusian Flamenco Centre, Regional Government of Andalusia. Jerez de la Frontera. The fascinating spectacle of a flamenco "tablao". Granada hosts the International Music and Dance Festival. "Ciudad de Carmona" National Flamenco Competition. Carmona.